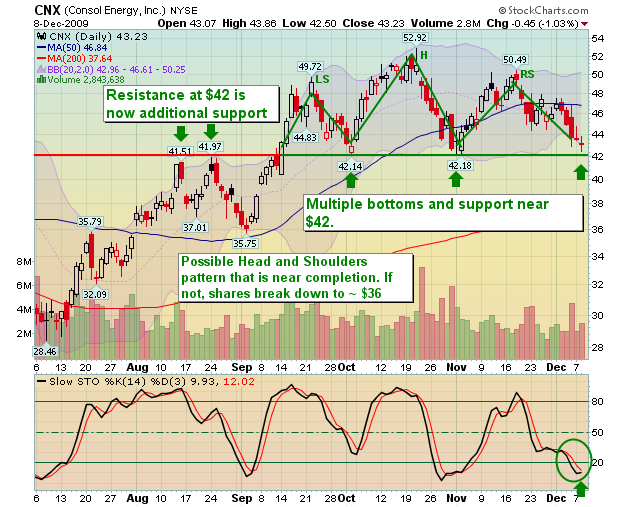 We have liked Consol Energy (CNX) as a trading position for some time. Sure there are problems related to Cap-n-Trade as well as the relationship of energy to the dollar. But, the company has standout fundamentals as well as the potential to sell a great deal of product to China. We had recently highlighted the news that China is ramping up their coal buying to bring up their stockpiles and Consol was one of the companies that may benefit. Consol Energy Inc., the fourth- largest U.S. coal producer, will sell coal to Asian markets through a partnership with Xcoal. The company will sell metallurgical coal from its Buchanan and Bailey mines and thermal forms of the fuel from its northern Appalachia operations, Pittsburgh-based Consol said today in a statement. Metallurgical coal is used to produce steel and thermal coal is used to generate electricity. U.S. coal producers have targeted Asia as a source of demand this year. Peabody Energy Corp., the largest U.S. coal producer, in October opened an office in Jakarta to further expand its Asian presence. Arch Coal Inc., the second-largest coal company, said it shipped steam coal to China off the West Coast in September. Coal miner Consol Energy Inc (CNX) launched an attack on environmentalists on Tuesday, blaming ecological “activism” for forcing it to idle two mines in West Virginia that employ nearly 500 workers. Technically, the stock has multiple patterns that could show both bullish and bearish trends. The multiple bottoms and strong support at this price is easily seen. But, there may also be a Head and Shoulders pattern that has formed and the right shoulder is continuing to create an extension lower. Of course that may also signal the end of the pattern with the Stochastics turning higher from an oversold reading. With the dollar selling off, this name has been a great benefactor of rising commodity prices. Now that the dollar has started to rise, it has suffered. Seeing that the Fed is in no mood to tighten, a weak dollar policy continues and we suggest that the support may be held. If not, a stop under $37 should be considered.